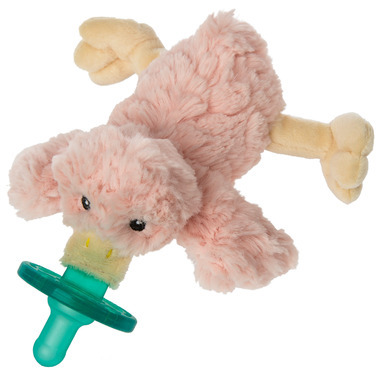 WubbaNub Blush Putty Duck pacifiers are easier to hold on to and harder to lose. The carefully calculated weight and size of each stuffed friend keeps the pacifier positioned close to even the fussiest baby's mouth. WubbaNub Blush Putty Duck is a part of the Mary Meyer Putty Nursery collection and comes with a sewn in Soothie brand pacifier. WubbaNub infant pacifiers have become almost a necessity for all new moms. A truly soothing gift, WubbaNub benefits are many. So cute and soft. Daughter loves it.